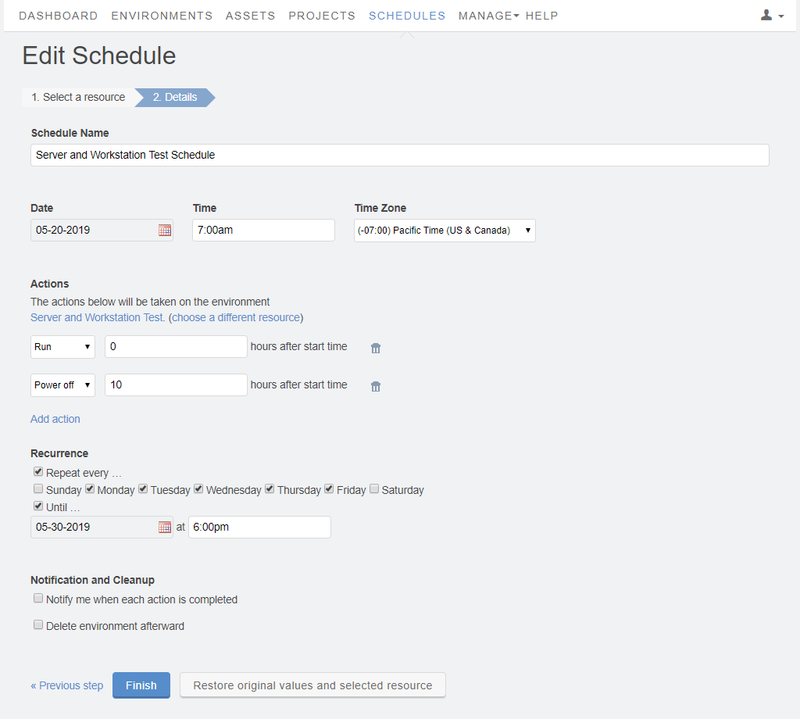 Add new schedules to control environments and templates. From the navigation bar, click Schedules, and then, in the Schedules window, click (New Schedule). The New Schedule window displays. 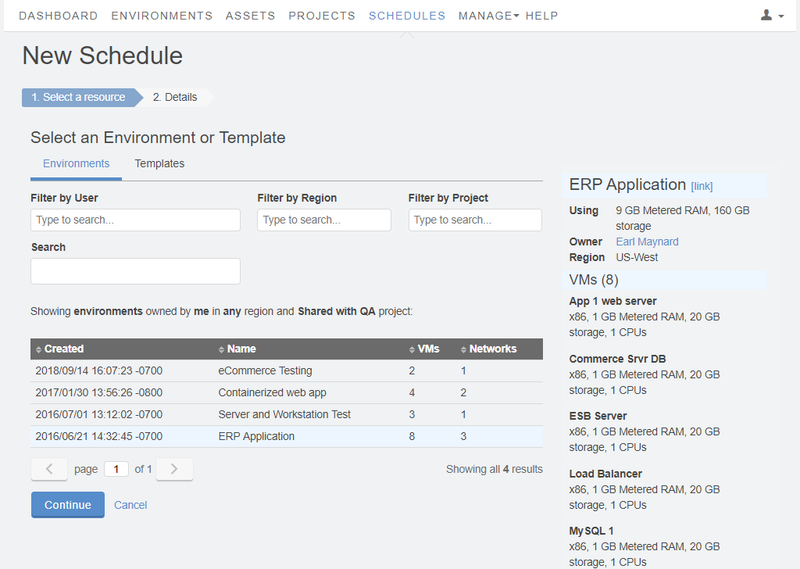 Select an Environment or Template to choose an existing environment or template that the schedule will use. Environment – Start with an existing environment. Template – Create an environment from an existing template and then apply the schedule actions to that environment. Me – Displays only the resources you own. Anyone – Displays all resources you can access. Filter by Region – Select a region to display only the resources within that region. Filter by Project – Select a project to display only the resources within that project. Click an environment or template in the results list to display details about it. Then click (Continue) to advance to the Details window. Type a Schedule Name to identify the schedule on the Schedules page. Select the Date and Time when the schedule will start. You can also change the Time Zone (the default is Pacific Time). Choose an Action and (optionally) specify the number of hours that the action should be delayed after the schedule starts (the default is 0). Power Off – Immediately powers off all of the VMs in the environment. If the environment will be deleted upon completion, choose the faster Power Off action, rather than Shut Down. Run – Starts all of the VMs in the environment or resumes the suspended VMs in the environment. If you want to save an environment that contains a Power VM or an x86 VM with more than 256 GB of RAM, include a Shut Down or Power Off action before the Save action, otherwise the Save action will fail. Shut Down – Gracefully shuts down all of the VMs in the environment. The Shut down action works for Power VMs and for x86 VMs that have VMware Tools installed. Suspend – Preserves the running state of the VM by writing the contents of RAM (including running programs and active data) to the disk. When you run a suspended VM, the RAM state is restored from disk. The Suspend action is available only for x86 VMs with 256 GM or RAM or less. Supported power-state actions for Power VMs and x86 VMs with more than 256 GB of RAM are Run, Shut Down, and Power off. If you want to add additional actions to the schedule, click Add Action. For example, you can set an environment to Run at a specific time then Shut Down, Suspend, or Power Off (so that the environment doesn’t run indefinitely). A single schedule can perform up to 20 actions. To delete an action, click . Repeat every – Check to set this schedule to automatically repeat. Sunday, Monday, Tuesday, Wednesday, Thursday, Friday, Saturday – Choose which days of the week the schedule should run. Until – Check and select the date and time that the schedule will cease to run or leave unchecked to have the schedule repeat indefinitely. By default, a schedule will run once and then delete itself. A schedule won’t repeat indefinitely if it creates or deletes a resource, including templates that create environments or that have Notification and Cleanup options enabled. To delete the environment at the completion of the schedule, you must check Until and specify a date and time that the schedule will complete. Notify user when each action is completed – Check to send email notifications about your schedule’s progress, including details of the event, whether the event succeeded or failed, and any errors that occurred. Delete environment at – Check and enter a date to automatically delete an environment. If your schedule includes Recurrence, the cleanup option, Delete environment afterward deletes the environment after the Until date and time that you specified in the Recurrence section. If you are using a template, Delete environment will delete the environment but leave the template. Then click Finish to save the schedule.